Do you use nerdtree? Leave a review! Is there any support for git flags? Can I have the nerdtree on every tab automatically? How can I open a NERDTree automatically when vim starts up? How can I open a NERDTree automatically when vim starts up if no files were specified? How can I open NERDTree automatically when vim starts up on opening a directory? How can I map a specific key or shortcut to open NERDTree? 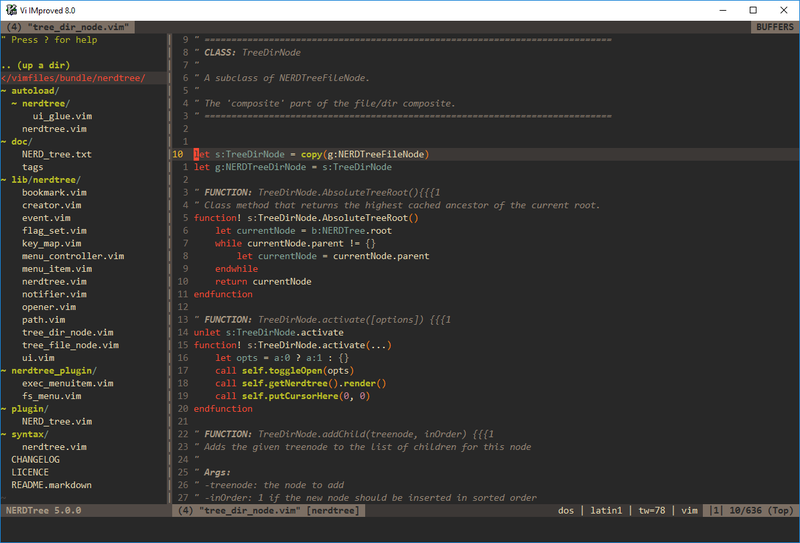 How can I close vim if the only window left open is a NERDTree? Can I have different highlighting for different file extensions? How can I change default arrows? over 2 years Not opening dir the first time, and skipping to next dir, when using enter. over 2 years How to disable a NERDTree mapping that conflicts with a custom mapping? about 3 years Documentation for keybinding API? about 3 years How to colorize executable files with different extensions? Add support for natural sorting order. fix about windows UNC paths. Use fnameescape to quote filenames for :badd. Determine if we're running in Cygwin on Windows. How to jump back to NERDTree from file in tab? how can I show hidden files (starting with period) in NERDTree? Is there a NERDTree or other project plugin for vim that integrates with git to show the status of files? How to scroll from vim buffer to NERDTree file? NERDTree gives error "x file(s) could not be loaded into the nerdtree"
NERDTree open in a new tab, as last tab in gvim? NERDTree: what does a starred/bold file indicate? Keep up with changes to nerdtree! Would you tell us more about nerdtree?